1. 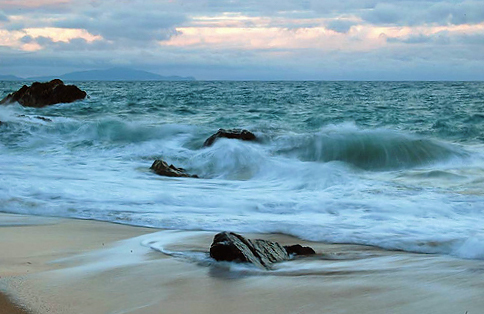 The time of day can make a huge difference when it comes to taking interesting beach shots. As you can see below, early morning as the sun rises or late in the afternoon as the sun goes down, can make some really interesting shadows along the beach. 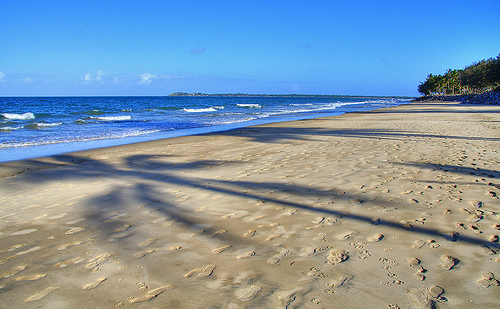 Not long after I purchased my digital SLR camera, I realized that the afternoon sun can make some fantastic beach photographs, with the shadows of the tree’s spreading themselves across the sand. Also, as you can see in the image above, the shadows in the wet area’s of the sand, as well as the footprints, are darker than they would have been if the photo was taken a couple of hours earlier. 2. Photographers who shoot beach landscapes in automatic mode, soon become frustrated with their photographs looking too under exposed. This is due to them setting their camera’s exposure on the white sand, which in many cases will result in an off white or grey color. Some photographers set up their shot as normal then over expose by one or two stops before taking the photo. This compensates for the under exposure. Other photographers make good use of their camera’s bracketing feature (check manual). What the bracketing feature does, is that it takes 3 images in different exposures. Then you can choose the one that looks the best. If you have a camera like the Nikon D40 that doesn’t offer a bracketing setting, then you can do this exposure compensation manually. Another trick I use myself, is to expose on the reflection of the waters edge. Then take a photo of the sand. This tends to make a nicer sandy color as seen in the example of footprints and shadows above. 3. As with any landscape photograph, it’s also important to watch your horizons when taking beach shots. More often than not, a crooked horizon in a landscape will annoying the day lights out of most viewers. If you find you’ve photograph the perfect shot, yet have a crooked horizon, it is easy to straighten if you own Photoshop CS2 or above. We have a tutorial for straightening horizons. The photographer was careful to shoot a straight horizon. If it were crooked, it wouldn’t matter how perfect the slow motion of the water was, it would be the uneven horizon that would take the viewers eye first. 4. Use a polarizing filter. 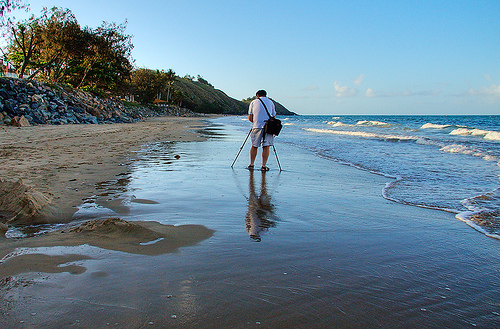 Many professional beach photographers swear by polarizing filters. Polarizing filters will make the sky and ocean photograph bluer than it normally would. Usually darker blue. 5. If your photographing people at the beach, experiment with using your camera’s onboard flash. Often when the day is very bright, it will enhance shadows across people’s faces. I recently read in a photography magazine that using flash (even in daylight) will help to eliminate unwanted shadows on a persons face or under the eye area. 6. Look for higher ground from which to photograph beach shots. 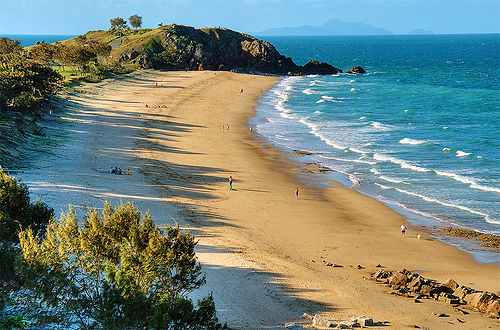 Another way to create an interesting beach landscape is to photograph it from a higher point. In other words, photograph it from a perspective that isn’t always seen by those visiting. Shooting this beach landscape from a higher viewpoint, helps show a different viewpoint than would otherwise have been seen. 7. Look for and photograph reflections seen in the waters edge. Reflections can often make a beach shot interesting. You will be amazed at how many reflections there are on the waters edge when you’re keeping an eye out for them. People, animals and nearby tree’s are some that are often seen. Focusing on reflections seen on the beach will create extra interest every time.